SpaceX is planning to launch its supercharged Falcon Heavy rocket on Tuesday, February 6 from the Kennedy Space Center in Florida. If it works, Falcon Heavy will be the most powerful rocket system in use today. SpaceX says Falcon Heavy could someday deliver more than 37,000 pounds of stuff to Mars in a single trip. You can watch SpaceX’s live video of the event to catch the historic moment as it unfolds. 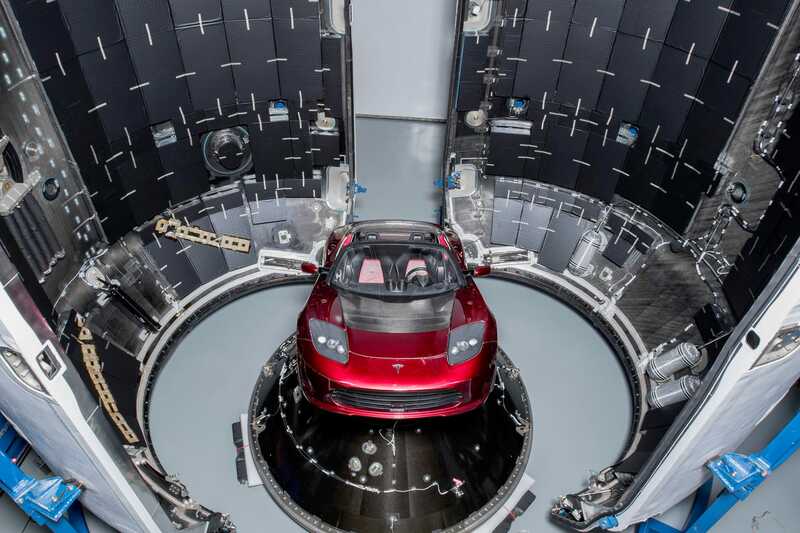 Elon Musk is getting ready to launch his own shiny red sports car to Mars orbit. 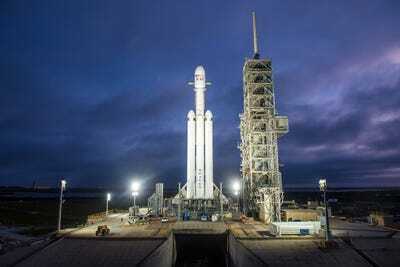 On Tuesday afternoon, SpaceX is set to launch its Falcon Heavy rocket for the first time, from a pad at NASA’s Kennedy Space Center. The rocket – the biggest and most powerful system SpaceX has ever built – will carry Musk’s red 2008 Tesla Roadster. The colourful stunt is meant to demonstrate how the company might someday help deliver people and other payloads into space. “Red car for a red planet,” Musk said on Twitter in early December. Musk has repeatedly warned that there’s a good chance Falcon Heavy could burst into flames before it reaches its destination. If this carefully coordinated space “ballet” works, however, Musk’s old car will be running laps between the sun and Mars in what’s called a hyperbolic orbit. On Monday, he even posted a photo of the car with a dummy driver Musk referred to as “Starman”. SpaceX’s Falcon Heavy system could one day ferry a payload of 37,000 pounds – roughly 14 Tesla Roadsters’ worth of mass – to Mars. That will come in handy if Musk ever manages to send humans to colonize the red planet. The key difference between the Falcon Heavy and other rocket systems is two-fold: it’s both bigger and cheaper. SpaceX/Flickr (public domain)SpaceX’s first Falcon Heavy rocket sits at launchpad 39A at NASA’s Kennedy Space Center on December 28, 2017. The 230-foot-tall Falcon Heavy system relies on three reusable boosters, which are each made of nine cone-shaped engines. Unlike most booster systems, these rocket-pushers are not for one-time use. When successful, the boosters push their payload into the sky, then detach, land themselves, and get refurbished for re-use. After a single use, boosters from other traditional systems generally fall into the ocean, burn up in the atmosphere, or get dumped on the ground. SpaceX first successfully tested the new recycling system in March of 2017 with its Falcon 9 rocket. Those same reusable cores make the price of a Falcon Heavy launch just $US90 million, about a third of the cost of the competition. Last week, SpaceX fired up Falcon Heavy on the launchpad, the first sign that the company was nearly ready for this week’s historic event. But the SpaceX boss knows the coming launch is no sure bet. Other space moguls are rooting for a successful launch for Musk. Amazon CEO Jeff Bezos, who’s heading up his own privately-funded space company, sent Musk a well-wishing tweet on Monday. Musk chimed back just hours later with his own kissy face for the Blue Origin boss. Those who want to watch the drama unfold can tune in to the livestream of SpaceX’s Falcon Heavy launch on Tuesday afternoon. The launch is scheduled to occur between 1:30 and 4:30 p.m. ET, though there is always a chance of delays. The Falcon Heavy launch is “guaranteed to be exciting, one way or another,” Musk quipped in a December tweet.